inches high. Buy it the easy way-order by phone. all filled with jelly. jam, nuts or chocolates. buy. Each box measures 4V,x3x I V. inches deep. 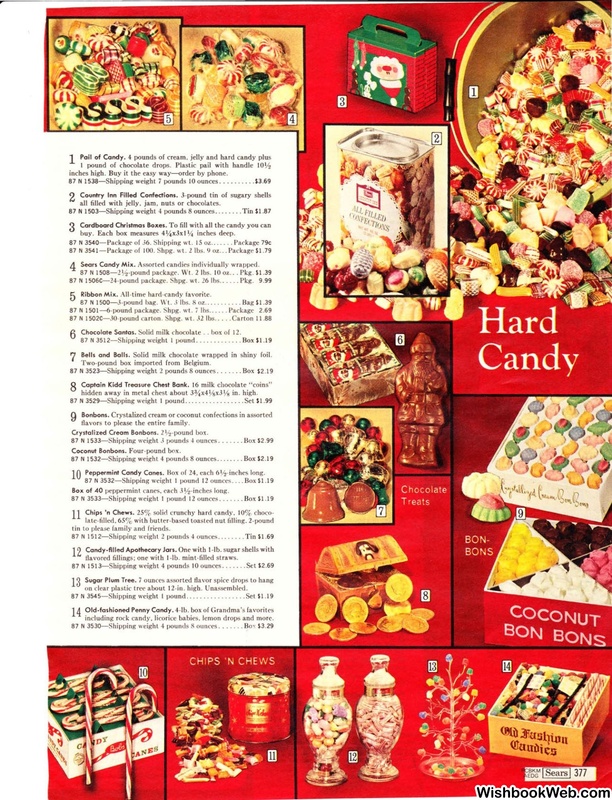 Sears Candy Mix. Assorted candies individually wrapped. Ribbon Mix. All-time hard-candy [avorite. Chocolate Santos. Solid milk chocolate .. box of 12. 3512-Sbipping weight I pound . Bells and Balls. Solid milk chocolate wrapped in shiny foil. Two-pound box imported from Belgium. Captain Kidd Treasure Chest Bank. 16 milk chocolate "coins"
flavors to please the entire family. Crystalized Cream Bonbons. 2\12-pound box. 1533-Shippin!? weight J pounds 4 ounces .. Box of 40 peppermint canes, each 3Yz-incbes long. tin to please family and friends . Bavored fillings; one with 1-lb. mint-filled straws. on clear plastic tree about 12-in . high. Unassembled . including rock candy, licorice babies. lemon drops and more.